Adapting novels to screen is often a difficult task. It’s hard to create the same emotional depth and portray characters accurately. Parts of the novel inevitably get left out to cut down screen time and overall this leaves fans feeling dissatisfied. Hadwin’s Judgement suffered from these same problems. Premiering last month at the Globe Cinema, Hadwin’s Judgement is an environmental documentary adapted from John Vaillant’s non-fiction novel The Golden Spruce. It was interesting, but lacked emotion, leaving viewers feeling disconnected from the story at large. 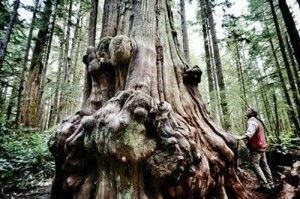 The central plot of the documentary focuses on Grant Hadwin a former Brithish Columbia logger that turns from tree hugger to environmental terrorist. Intermixed with this story was various interviews from former friends and colleagues, environmentalists, scientists and the Haida people native to the land. The novel which originally came out in 2005 was a few years behind the initial incident in 1997 but now 19 years later the film needed to re-introduce its audience to the story and sadly it failed to do so. While the story behind the film is interesting enough it was meant for print. The one upside of bringing the story the screen is audiences are able to see the beauty of the BC forests first hand and if the film does one thing right it is visually stunning. The cinematography is beautiful and audiences really feel as if they are in the forest themselves, but you end up being more attached to the scenery then you are the characters. Grant Hadwin, an actor that rarely speaks throughout the entire story portrays the protagonist on screen. He’s meant to be the main character, someone to ground the story but because he is treated as just a moving body the film leaves nobody for viewers to connect to. Hadwin’s Judgement only briefly mentions the environmental havoc that the logging industry is creating and focuses mainly on Hadwin himself. Overall the focus of the story only offers audiences a small amount of information on the environmental issue the film should be talking about and the recreations and re-imaginings distance the story from reality even further. Now I am left with one question after watching the movie, how many trees were harmed in the making of it?